Pirates used an Italian journalist's credentials to grab game files. Square Enix has busted out its lawyers on the people responsible for leaking a preview of Deus Ex: Human Revolution earlier this year. The build was intended to only be seen by the press, but ended up on torrent sites in late May. The publisher's complaint named "Does 1-15" as the defendants, as Square Enix didn't know their real names. The suit described how the game ended up online, with the unnamed defendants downloading it from Steam using an Italian journalist's credentials and then uploaded the files to torrent sites. The suit said that the IP address used for the download did not match the one used by the journalist, or any associated with the journalist's publication, GMC. Square Enix stated that it had suffered damages in excess of $5,000 thanks to lost sales, and was seeking an unspecified sum in restitution. While Square Enix is apparently not happy about the leak, it's thought that it benefitted from it. 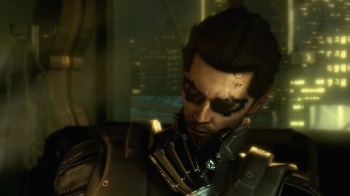 The leak allowed Deus Ex fans, who were skeptical about whether Eidos Montreal could possibly make a worthy successor to the original, to see the game and assuage their fears. Some even speculated that Square Enix had orchestrated the link itself to generate excitement about the game, although this lawsuit has seemingly put paid to that; the publisher is unlikely to waste the courts time for a marketing stunt. Deus Ex: Human Revolution comes out for PC, PS3, and Xbox 360 on August 23rd.